Using an online legal service like IncFile is a reliable way to form an LLC, and it’s much less expensive than hiring a lawyer. 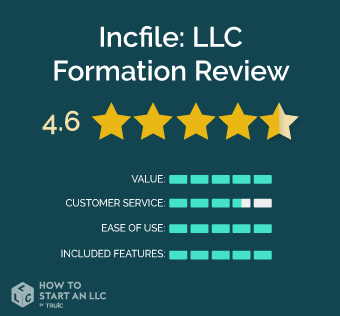 In this review, we’ll go over the details of IncFile's LLC formation service and explain how it compares to other services on the market. Read on to find out if IncFile is the right choice for you. Headquartered in Houston, Texas, IncFile has helped form over 75,000 businesses since 2004. IncFile is not as well known as some of the larger providers of online legal services, such as Legalzoom and Rocket Lawyer, but has established a reputation for providing high quality service for a lower cost than the competition. Who is IncFile right for? Incfile is great if you are working with a limited budget, but want a lot of added features. One year of free registered agent service and free LLC compliance reminders make Incfile an excellent value. Fast and easy checkout process; complete your order in under 10 minutes. Our recommended alternative to Incfile is Northwest. They provide great value and customer service, you can read our full review here. Our free guide shows you how to form an LLC yourself. Similar to most other LLC formation services, IncFile offers multiple tiers of service: Silver, Gold, and Platinum. All three IncFile packages offer exceptional value. We break down the differences between each below. Short of filing your own LLC, IncFile Silver offers unbeatable value at $49. This doesn't include government fees, of course. Competitors charge $25 to $100 more to form your LLC. Who should purchase Incfile Silver? Competing service providers charge hundreds of dollars extra for these services and benefits. IncFile Silver will appeal to customers who want an affordable way to file their LLCs fast. This package is all you need if you don't mind putting in a little time for other necessities like creating an operating agreement and registering for an Employer Identification Number (EIN). IncFile’s mid-tier package starts at $149 - $100 more than Silver. 20 Personalized Stock Certificates - for distribution in case of more than one owner. Employee Identification Number (EIN) - needed to open a bank account and file taxes. This service costs $70 extra if purchased separately. Operating Agreement - required in some states. This document sets out the ownership rights, duties, and operating procedures for the business. This service costs $40 extra if purchased separately. Banking Resolution - authorizes who opens and can use bank accounts and credit lines. This service costs $35 extra if purchased separately. Who should purchase Incfile Gold? Go with IncFile Gold if you're worried about making mistakes outside of filing the LLC papers. Especially if you'd prefer someone else handles the EIN registration for you. The Operating Agreement and Banking Resolution documents are worthwhile for new business owners. Otherwise, you can save money with the Silver package and buy the forms you need a la carte. IncFile’s premium package starts at $249, $100 more than IncFile’s Silver package. Who should purchase Incfile Platinum? IncFile Platinum may represent a good value if you want the LLC kit and expedited shipping. If you need a website, the included web design and hosting services are invaluable. These extra perks come at a premium but are otherwise an effective way to get up and running fast. Comparing the total cost with what you get, IncFile offers incredible value. None of the tiers seem bloated with unessential features - as is the case with a few competitors. Many of the basic and standard packages include services other providers include at a cost. The only unmet expectation was the amount of effort it took to get in touch with customer service. During our trial run of their service, it took a few calls for a representative to pick up the phone. Otherwise, IncFile processed the order fast and without issue. After getting in touch, IncFile customer support was professional, knowledgeable, and responsive. The order process took no longer than 10-15 minutes. It helps to prepare by having all your necessary business information at the ready. Don't have enough time to complete the order in one sitting? No problem. IncFile saves your progress, which you can pick back up later when it's more convenient. IncFile ships your paper copies and other ordered items together. This happens once the LLC formation processes through your state.